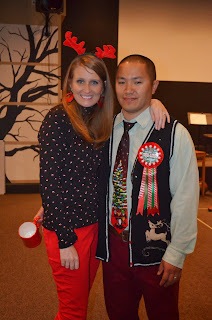 Last night was the annual (now that we have done it 3 years in a row I think it qualifies as an annual event) lifegroup tacky christmas party. Our extended lifegroup (the three lifegroups that were once one) has way outgrown anyone's house so we had the party up at the Rivertree Treehouse. It was a little like a trip down memory lane since we used to have so many lifegroup evenings there. Everyone dorned their ugliest christmas attire, brought an appetizer or dessert to share and just had a good time spending time together. There was so much good food, it was pretty ridiculous. The sugar to veggie ratio was highly skewed in an unhealthy direction. But we ate well. And amazingly with no food sign-ups we wound up with only one duplicate food...and who doesn't need two trays of chocolate chip cookies. One of the most awesome additions was the tray of "tacky christmas cookies" Chris and Christie brought...so appropriate. 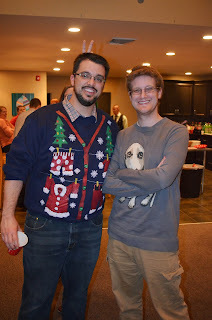 We had a little competition and vote for who had the ugliest sweater. There were so many potential winners, but Mike Parton won by a landslide. And has his prize he got to wear a winners ribbon for the rest of the night and take home an commemorative "ugliest sweater" mug. We did our best to get a group picture. It was a bit like herding cats, but finally we got it, with almost everyone looking the same way at the same time. I love the couch full of kiddos. Perry was a trooper and stayed up and happy just a tad past his bedtime. But he loved being around everyone, watching the bigger kids play and getting so much attention. Lastly, I took a toll down memory lane in our picture files and dug out this gem of a picture of me, Gina and Reagan from last year's tacky christmas party. Here's a side by side comparison of 2012 to 2013. Apparently Gina only has one tacky christmas outfit; which may be a good or bad thing. Perry meanwhile is so much bigger and so much more fun now this year than he was last year. I love these girls so much. Tacky Christmas is one of my favorite holiday traditions. How better to kick start the season than with a bunch of ugly christmas sweaters and friends?